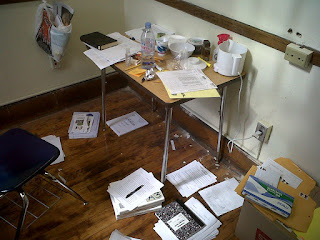 Approximately six years ago a black hardcover library copy of Henry Miller's Tropic of Cancer (above near upper left hand corner) was stolen from my "desk". In the lower right hand corner is a stack of manuscripts for, Yes Dear!, a children's book that I wrote that were waiting to be mailed. The book was never published, but an eerily similar book, Yes Day!, was published. Last Tuesday I left my tattered and copious notes filled copy of Miller's Plexus in the bathroom of the same establishment in Manhattan. I was planning to add additional points from Plexus to the second edition of The Allure of Nymphets. However, the novel was gone when I returned the next morning. The janitor said that he saw Plexus, but that he had left it in the john. 7. Keep human! See people, go places [...]. 9. Discard the Program when you feel like it—but go back to it next day.